Back in the dark days of January I wrote an article (Walpole Park and my dog-walking worries) bemoaning the loss of much of our local park and expressing some doubt as to whether the council would deliver it back to the good citizens of Ealing in line with their rather vague deadline of early 2014. Serious progress has been made, but ... there is an I-told-you-so coming ... it's so not finished, and I think we've sailed way past that early 2014 deadline - and then some. But we still can't get in to enjoy it: the blur to the right hand side is due to my having snapped the shot through a gap in the railings that still divide the park. And whilst there's a lot of heavy plant moving around it was impressive yesterday to see how many people were catching the rays and making the most of the green space that was available to them. I think it's a special talent that we have developed here in London. We may not know much about a lot of things, but we certainly know how to rock a lazy afternoon in the park. Just look at this kindergarten class who've swapped their classroom for the blue sky and the leaf canopy overhead. And, seriously, when did you last see such a cool multi-baby buggy? What a mothership! 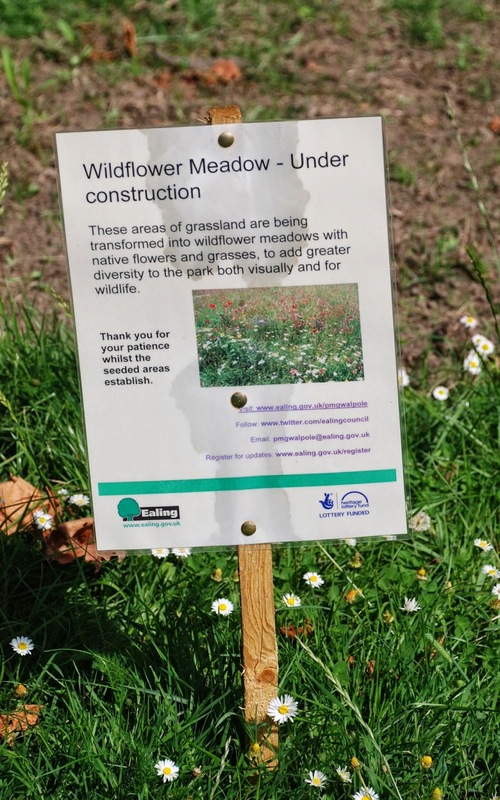 And, best of all, the funny bits where it looks like they've dug up the grass for no good reason are being cultivated as wild flower meadows. Next year I look forward to celebratory picnics on sunny afternoons when the cornflowers, the poppies and the clover will be in bloom. It's going to be epic! They're busy building a new play area for the little people, which looks pretty amazing too. Emi and his chums will have a ball playing there when it's all done and dusted. They've planted gazillions of roses and shrubs along the pathways, and it's all shaping up to look rather splendid. Over in the adjoining Pitshanger Manor, one-time country get-away of the famous architect, Sir John Soane, they're hosting an art exhibition. It seems an appropriate venue given Soane's connections: back in the day he entertained art-world luminaries such as JMW Turner in this place. And the great thing about it is that it's an exhibition of local artists who want to get their names out there. You can pop along until 21st June, admire the work on view and buy it if it really takes your fancy. It's Ealing's answer to the Summer Exhibition over at the Royal Academy on Piccadilly, and I think it's great that we have a showcase for our local talent. And that's something that chimes with the ethos of the park behind: it's the people's park and is something that just about everyone in the area feels they have a stake in. Just take a look at the number of trees and park benches that are dedicated to the memory of loved ones who have passed away. I'm sure all the work will all be worth it in the end, but for now I'd just like it to be over so that we can let our dogs and our children race around without having to worry about them getting run over by a JCB. It's wonderful that your local politicians are taking care of such a wonderful place and restoring it. It looks like it will be really terrific when it's all done. Parks and outlets for the arts are so important to the enjoyment of life! Great write-up! How lovely! Parks make city living possible in my opinion! How fun! I love the person just strumming on the grass. A good park is a gem! thanks for linking in to good fences - although i'm certain you'd like to see those fences come down soon! All great photos, like a collection of how life should be. Music on the grass, and such a fun wildflower under construction sign too. Wow that is going to be an awesome park once it's completed. I love the idea of all the rose bushes being planted and the Wild Flower gardens. Oh, it's going to be wonderful! The wild flower gardens will be a beautiful addition. Love that shots of people enjoying the lazy days of summer! Thanks for sharing with SYC.